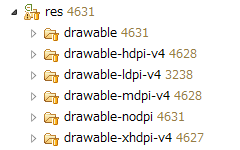 "tDpiInfo" is a developer tool that can confirm Dpi information etc. on the Android device. Because Android corresponds to the multi screen, it can be used on devices with different resolutions. Android automatically allocates the image that can be referred (Android sdk 1.6 and higher). But,There is no means to confirm easily. 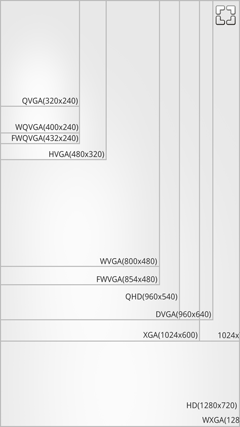 If this is installed, any pixel density of the device is understood (hdpi，mdpi，ldpi). The screen is a device of Android OS 1.5. The resolution and Density are displayed. 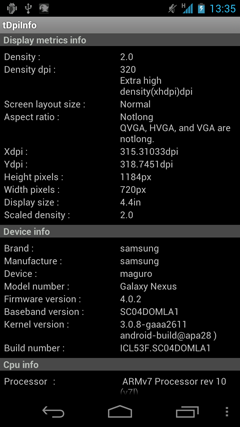 This is a content displayed in device information and setting menu of Android device. The 'Show Rect' screen can be displayed by selecting "Menu" - "Show Rect". This was displayed with some devices. Download from Android Market "Applications -> Software libraries"
The item addition that is new in Display metrics info. The 'Show Rect' function was added. 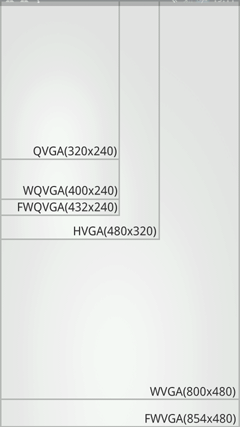 The screen size of 600x1024 and 640x960 is added to Show Rect. 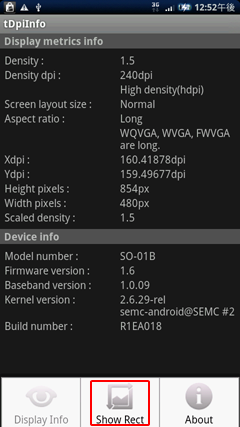 Xdpi density devices are supported. Can be moved to the SD card. The 'Show Rect' function was updated. To be able to download from the Google Play in terminal without the camera. 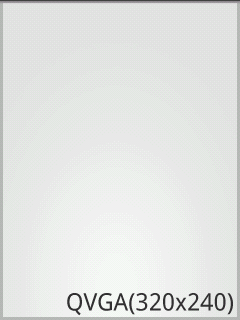 Add a screen Typography Sizes. 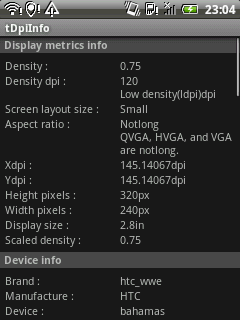 Add to tvdpi Density Dpi.